Successful salespeople learn to recognize and overcome barriers to communication. There are two types of such barriers: those arising from the environment and those stemming from the hearer's resistance. If you've ever tried to talk with a friend at a crowded and noisy business party, you can readily understand how the environment can present major barriers. If you've ever tried to carry on a conversation in a room where a rock band was going full blast, you can appreciate the noise barrier. A good general tries not to commit his troops on terrain that presents inherent disadvantages. Good communicators follow similar strategies. They try not to set up conversations in settings that will compete for attention. When you are communicating with an individual, that individual deserves your full attention. Choose a time and a place that will minimize interruptions. If you're meeting in your office during business hours, have your secretary hold telephone calls, or use your telephone answering device for the duration of the conversation. Many executives set aside certain times of day during which they will receive telephone calls and unscheduled visitors. The rest of the time, they reserve for creative thinking, strategic planning, decision-making and other duties of leadership. When disturbances do occur, try not to talk over them. If the disturbance is obviously temporary, suspend the conversation until the interruption is past. If it's obviously going to be prolonged, try to reschedule the conversation for a more favorable time. I often teach salespeople where to sit on sales calls or when they're conducting business over a meal. My advice: Put the other person's back to any distractions, so your listener's attention won't be constantly diverted by what's happening in the background. Finally, pay attention to comfort. I've given more than 5,000 speeches and seminars, and I've battled all kinds of odds. I can tell you that audience discomfort is one barrier you can't overcome: your only winnable strategy is to avoid it. So stay away from settings that are too hot, too cold or otherwise uncomfortable. Nobody can concentrate while in a state of discomfort. And if the person you need to communicate with is ill, injured or going through some emotional trauma, it's best to reschedule the conversation. Otherwise, you're going up against impossible barriers to communication. Monitoring the environment is the task of any person who wishes to communicate, whether as a company leader, a salesperson, a manager, or a letter writer. You just can't ignore such barriers. To do so is to give up and let the competing voices have your audience. If people are distracted or interrupted, or they feel uncomfortable, they're not likely to tune you in completely, understand your message thoroughly, or respond to you positively. Barriers resulting from audience resistance fall into two categories: external factors that cause people to tune you out, and internal factors that prevent them from giving you their complete attention. People often form first impressions on the basis of external factors. If the first impression is negative, you won't get the person's attention. Look for characteristics of dress, speech and actions that may be turning people off. If your dress is too casual, frivolous or distracting, you may be losing listeners. If your voice is strident, shrill or guttural, people may find you unpleasant to listen to. In certain areas, regional accents may turn people off. If you speak with a pronounced regional accent and are doing business in a region where that accent is not commonly heard, you may have to look for ways to overcome this barrier. You may want to work on acquiring a more generic accent. Or you may want to spend some time cultivating the person's confidence. It goes without saying that good grooming and good personal hygiene are essential to good communication. Body odor, halitosis, or a disheveled appearance will cause people to turn away from you. Internal barriers to communication may stem from a lack of interest in what you're saying or a lack of understanding. If you discern a lack of interest, then your task is to find some way to lead your listener to identify with your message. How does it concern your listener personally? What bearing does it have on the listener's job, income, health, family, or security? Once you establish that point of identity, you'll have attention. People have a way of erecting defense mechanisms and emotional barriers when they feel threatened by what you are saying or by the way you are saying it. Studies have repeatedly shown that people, like other creatures, feel protective of their territories. Invade those turfs, or act in a threatening manner, and you will be sure to turn off their attention. When your task is to deliver an unpleasant message or to persuade your listener to take some unpleasant action, look for ways to neutralize the negatives and to reassure the person who feels threatened. Sometimes, it's just a question of not understanding what you're talking about. During World War II, the United States raised money for defense by selling war bonds. In some remote parts of the country, where newspapers, radios and public schools had not yet penetrated, people were a little slow to learn about the heroic leadership of Winston Churchill, the Japanese sneak attack on Pearl Harbor and the determined response of Franklin Roosevelt. So when a bond salesperson approached a farmer who was out in the barnyard slopping his hogs, the salesperson was frustrated at the lack of interest in his patriotic mission. "Wouldn't you like to help out by buying some war bonds?" he asked. "Reckon not," replied the farmer. "Wouldn't you like to join the defense effort with Mr. Roosevelt? "Aren't you upset over what they did to Pearl Harbor? "Don't you want to be on the side of Churchill?" "So you don't want any bonds? Frustrated, the salesperson moved on. The farmer's wife came over and asked who the stranger had been. "Some fellow had a story about a guy named Roosevelt who got a woman named Pearl Harbor in trouble over on the side of Church Hill and wanted me to get his bond." Sometimes, you have to explain very carefully. The most important thing you can do to make sure that you're understood is to keep your communication simple. People don't like to be led through a maze of words and mental meanderings before they reach the main point of your message. Once while evangelist Billy Graham was flying into Dallas to address the student body of a large seminary, a storm moved in. Visibility at the airport became so low that his plane couldn't land. So it had to circle over the city for several hours -- long beyond the time of his scheduled appearance. But no one on the ground knew that his plane couldn't land. "It occurred to me while I was up there circling around," he later told a group, "that as preachers, we spend most of our time circling around in a fog, while people are wondering where in the world we are." It's a condition that plagues people in any business. The high art of plain talk is simply saying something so that it can be understood. 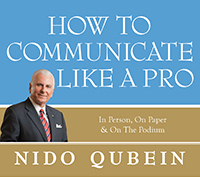 "Nido Qubein has created the toolbox for any and all who aspire to be today's master communicators."